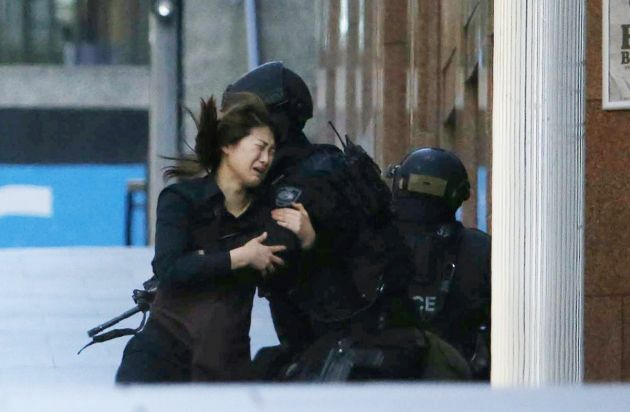 (Photo: REUTERS / Jason Reed)A hostage runs towards a police officer outside Lindt cafe, where other hostages are being held, in Martin Place in central Sydney December 15, 2014. Two more hostages have run out of the cafe at the center of a siege in Sydney, Australia's largest city, according to a Reuters witness at the site. The two women were both wearing aprons indicating they were staff at the Lindt cafe where a gunman has been holding an unknown number of hostages for several hours. Three men had earlier run out of the cafe. Mosques, synagogues and churches offered prayers in Sydney after their leaders called for a show of community solidarity and prayed for a peaceful outcome of the lethal siege as it unfurled Monday. Australian police said three people were killed during the 16-hour standoff at a Sydney cafe, including the Islamist hostage-taker. The gunman, identified as 50-year-old Iranian refugee Man Haron Monis, was said to be out on bail for a number of charges relating to violence. Four people were injured, including a policeman hit by gunshot pellets, the BBC reported. Police said they heard gunshots before storming the café where the standoff occurred. "Australians awoke to the news this morning that the siege in Martin Place has ended," Australian Prime Minister Tony Abbott said December 16. "Our thoughts and prayers are with the families of the two deceased hostages, the wounded and the other hostages. "I commend the courage and professionalism of the New South Wales Police and other emergency services involved." Muslim leaders in Australia's largest city were quick to condemn the siege, said SBS news quoting the AAP. "In times of great adversity it is imperative that we remain calm, united and stand together," Lebanese Muslim Association President Samier Dandan said. "My thoughts and prayers - and those of the entire Catholic community - are for the hostages and their families, and for our police officers who are working to resolve this situation peacefully," said Archbishop Anthony Fisher in a Sydney Archdiocese press release. Jarrod McKenna, a Westcity Church Teaching Pastor, urged those of faith to pray "for the safety of the hostages, and that our nation will not become hostage to fear and hatred," SBS of Australia reported. Vigils were held at Sydney's Lakemba and Auburn Gallipoli Mosques, Omar Bin Alkhattab Mosque in Adelaide, Holland Park Mosque in Brisbane, the Caulfield Hebrew Congregation Synagogue in Melbourne and the Theo Notaras Multicultural Centre in Canberra. St. George's Anglican Church in Paddington and St, Mark's Darling Point in Sydney also opened for prayer. "One of the greatest strengths of our nation is that we come out stronger from every calamity - and we will come much stronger out of this and strengthen our country through our unity and diversity" said Ali Kadri, president of the Holland Park Mosque in Brisbane. "We're hoping that all our fellow Australians will join us in the prayer for the safety of the people in the cafe. Certainly this action today is not an embrace of peace. It is an act of lunacy as well as criminality." "We started praying for the safety of the people in the café," said Muslim community figure Keysar Trad. Islamic leaders met with authorities, offering help and information. The Mufti of Australia and National Imams Council said in a statement that they were devastated, and were praying for a peaceful resolution. "The Grand Mufti and the Australian National Imam Council condemn this criminal act unequivocally and reiterate that such actions denounced in part and in whole in Islam," the statement read. "We along (with) the wider Australian society await the results of the investigation about the identity of the perpetrators and their underlying motivations behind this criminal act." The Arab Council of Australia said the perpetrator should face the full force of the law. Jamal Daoud, whose western-Sydney based Social Justice Network has been fighting against radicalisation for the last four years, warned of an impending attack six weeks ago on SBS. "We started to hear from some community young people that they should take the law into their own hands and retaliate," Daoud told SBS.